CHELSEA, Manhattan -- The New York City Police Department said the explosion in Chelsea Saturday night that injured dozens of people was "definitely" a bomb, with components indicative of an IED being found at the blast site. Law enforcement sources tell ABC News that the explosives in both Chelsea and in New Jersey were set off by cell phones. Multiple law enforcement officials tell ABC News that investigators are exploring the possibility the two explosions in Chelsea and Seaside Park are linked to the same bomber or bombers by what appear to be similar types of cell phones. ABC News is cautioned that this is only a line of inquiry and not a conclusion. The probes remain separate but coordinated. NYPD Commissioner James O'Neill said investigators are working to determine the motivation behind the bombing and find out who did it. He described the multi-agency effort as a "very complex post-blast investigation." "We definitely had a bombing last night on 23rd Street and we had a suspicious device on 27th Street," O'Neill said. O'Neill would not elaborate on the details of the device found on 27th Street, saying it was still being investigated. He said it was discovered by state troopers who were combing the area for secondary devices. Trace elements found at the scene are consistent with a pressure cooker. Investigators can't say with certainty what it was because the debris is small and key pieces that define a pressure cooker such as the handle or cap haven't been found. The pressure cooker recovered at West 27th Street is currently considered the best piece of evidence so far and the operating theory, which remains unproven, is the two incidents are related. The NYPD has recovered useful surveillance from that location and is talking to potential witnesses about seeing a potentially suspicious man carrying a briefcase earlier in the evening. During the Sunday briefing, Mayor Bill de Blasio reiterated that this was a very serious incident, and asked that New Yorkers be patient while investigators work to solve the case. "This was an intentional act, but we do not know the motivation. That's what we have to do more work on," said de Blasio. "We know there was a bombing. We will be very careful and patient to get to the full truth here." Watch the full Sunday afternoon news briefing with NYC and federal officials updating the Chelsea bombing investigation. The mayor said the Chelsea bombing does not appear to be connected to the explosive device that went off in Central Park earlier this summer. He said New Yorkers will notice an increase in police presence across the city, especially with the United Nations General Assembly taking place in the city this week. Though, all officials stopped short of calling the incident an act of terrorism, saying if the investigation determines it was a terrorist act they will call it as such. Twenty-nine people were injured in the blast that occurred on West 23rd Street between Sixth and Seventh Avenues at about 8:30 p.m. Saturday night -- all but one of the injuries was minor. As of late Sunday morning, the hospitals where the patients were taken said all have been treated and released. New York Gov. Andrew Cuomo announced Sunday he's deploying 1,000 state police and National Guard troops to New York City to help with security efforts. Gov. Cuomo held a news briefing near the site of the explosion on West 23rd Street in Manhattan Sunday morning. The governor said that in addition to the deployment of personnel, the states of New York and New Jersey are sharing resources to investigate the Chelsea explosion and the blast that happened earlier in the day in Seaside Park, New Jersey. Though, Cuomo said the devices used in the two explosions appear to be very different. 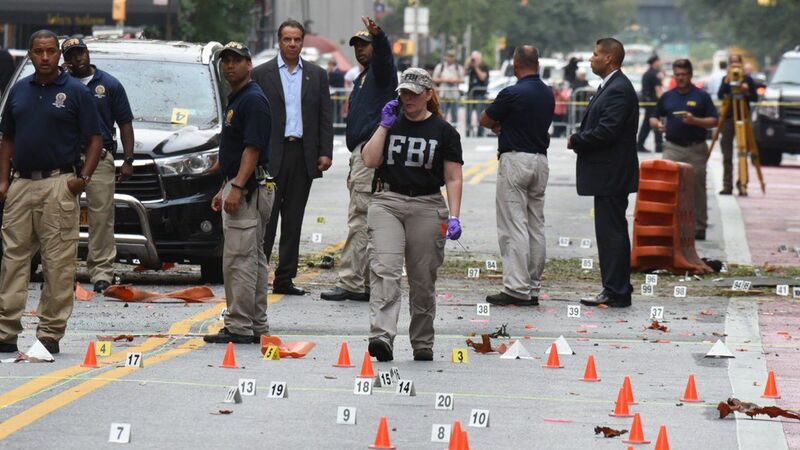 Cuomo said evidence gathered in the Chelsea incident is headed to the FBI headquarters in Quantico for analysis. He was more straight-forward in calling the bombing an act of terror. "A bomb exploding in New York is obviously an act of terrorism, but it's not linked to international terrorism," Cuomo said. "In other words, we find no ISIS connection, et cetera. But a bomb going off is generically a terrorist activity." Cuomo said the device that exploded on West 23rd Street and the non-detonated pressure cooker found on West 27th Street were both similar in design - but added that the FBI is still assessing. Gov. Andrew Cuomo gives update on Chelsea explosion the morning after the blast. Multiple law enforcement sources told ABC News that Tannerite, an explosive used for making exploding targets for firearms practice, is the likely source of the West 23rd Street detonation. Tannerite is a binary explosive that can be bought in kits and available for private use with little regulation. The secondary possible device is still with the NYPD bomb squad in the Bronx, where no determination has been made as to whether the pressure cooker is an actual explosive device. "We're not going to let them win. We're not going to let them win, " Cuomo said. "What do they want? They want to instill terror. That's what they want. They want to make you afraid. They want to make you worry about going into New York City. We're not going to let them instill fear."